A brunch or breakfast celebration is delicious fun. 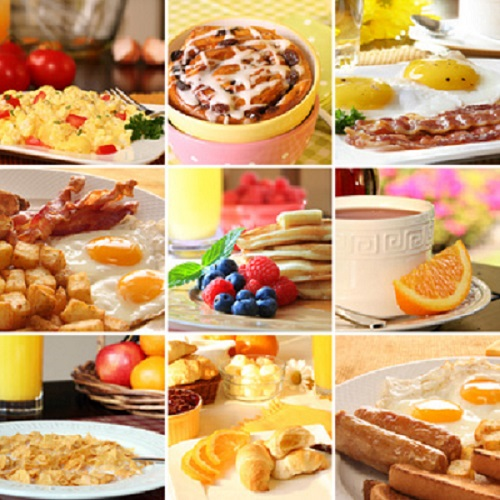 Everyone loves breakfast food and who doesn't love brunch! These amazing recipes are designed to please on any brunch or breakfast menu. Thaw hash browns in a colander to allow draining. Thoroughly squeeze dry. Add a little olive oil to the bottom of a 9-inch springform pan. Line with a large sheet of parchment paper including the sides. Brush paper with more oil. Combine the hash browns, melted butter, egg and seasonings in a bowl and put them in the pan pushing them up the sides. Cook in a preheated oven at 400° for 20-25 minutes or until the hash browns start to crisp up and brown slightly. Add a tablespoon of oil to a small pan and sauté the onions, pepper and garlic until soft and translucent. Add the spinach and cook briefly until wilted. Set aside to cool. In a bowl, combine the eggs, milk, cheese and bacon. Add the cooled vegetables and stir to combine. Season with salt and pepper and pour into the hash brown crust pan. Reduce the heat to 350° and bake for about 30-40 minutes or until the edges are set and the center jiggles just a bit. Preheat oven to 350º. Sauté onion in butter until tender. Whisk together eggs, cream, milk, salt, lemon peel, nutmeg and onion. Add shrimp, cheese and flour. Pour into pie shell. Bake for 30-40 minutes or until knife inserted in center comes out clean. Preheat oven to 350º. Grease a large quiche dish or 6 to 8 individual ramekins. Sauté bacon, peppers and onion until soft. Drain on paper towels. Whisk eggs with potatoes, cheese, salt and pepper. Mix in bacon and vegetable mixture. Pour into prepared pan spreading mixture evenly. Bake for 45 minutes, until center is set or knife inserted in center comes out clean. Bake 20-30 minutes for individual ramekins. Heat butter in a large frying pan on medium. Cook banana slices for 1-2 minutes each side, until lightly browned. Remove from the pan. To prepare syrup, place 1/2 cup honey and apple juice in small saucepan over low heat; heat through. Set aside and keep warm. Melt butter with remaining 1/4 cup honey in large nonstick skillet over medium-high heat. Add apples; cook and stir about 4 minutes or until apples are lightly caramelized and crisp-tender. For each serving, place 2 waffles on plate, overlapping slightly. Top each waffle with 1 slice ham. Top with 1/4 of apple mixture and drizzle with 1/4 of syrup.